If you need to know it, here it is! 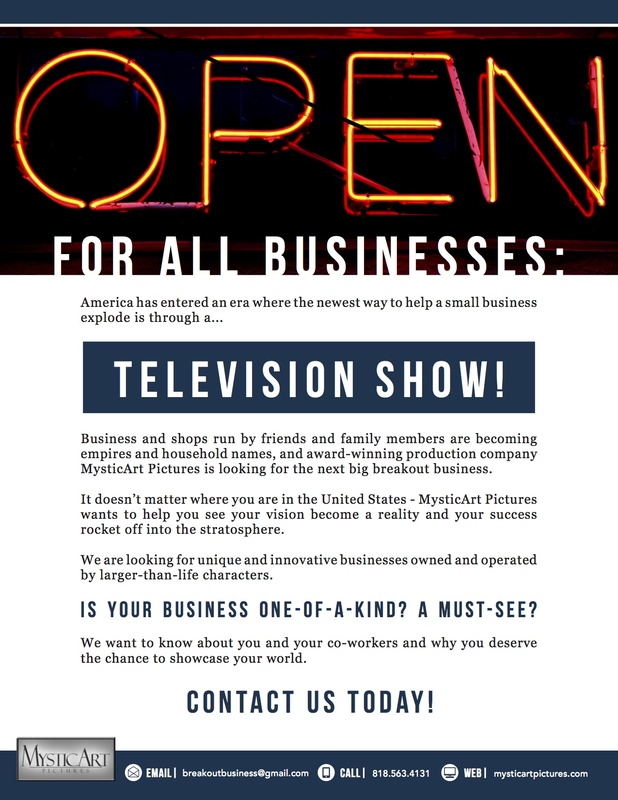 [CASTING CALL] Do you have a Small Business? It’s Your Gyrl, Ms. Carmen aka Platinum Voice PR bringing another Casting Call to you! This time it’s for small businesses and Mystic Art Pictures wants to cast you! NOW ACCEPTING APPLICATIONS FOR WIPEOUT!! A casting search is underway to find dynamic men & women to take part in a once-in-a-lifetime opportunity! You don’t need to be an athlete to participate. -Dynamic men & women over 18 years of age, including but not limited to: singles, exes, models, nerds, family teams, boss / employee teams, fraternities, sororities, geeks, goth / alternative individuals, and anyone else who is ready to take on the course! -Legal residents of the U.S.
Click HERE to fill out your online application. If you have any questions, you can email us at wipeoutcasting@gmail.com. For more information, please contact MysticArt Pictures at 818.563.4131. STEP 1: CLICK HERE and fill out an online profile and WIPEOUT 2014 application. You MUST upload a photo to be considered. STEP 2: Our casting department will review your application. If they would like to bring you in for an audition, they will contact you to schedule an appointment at our Burbank office. STEP 2: You may attend one of our open call events listed below. You will need to bring along a copy of your driver’s license and health insurance card (if you have it). STEP 2: Make an audition video! Please see the official submission guidelines on our video auditions flyer below. Stay tuned for new open casting call information!! -Be creative in your interview! 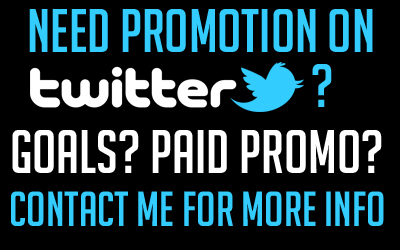 Anything you can do to get our attention is fantastic! Show us your larger than life personality! You can come dressed in a costume, but don’t wear anything that covers your face (i.e. face paint, sunglasses, hats, masks, etc), sing a song, show us your battle cry for the start of the course, do your victory dance…dont be afraid to think outside the box! -Get there early!! There are going to be lots and lots of people, so the earlier you get there, the better!! -You will be standing in line, most likely outside, for an extended period of time. Please be prepared for it. Wear comfortable shoes, bring a hat and sunglasses, a book or something to keep you occupied, bottled water, a few snacks, and lots of enthusiasm!! -We encourage you to bring friends! Come in a huge group and make your time at the event that much more fun! -When you get to the check-in table, please let us know if you are part of a family team, couple, boss / employee team, newlyweds, twins, or exes. Both team members must be present for you to be considered as a team! *Disclaimer: Attending an open call event does not guarantee an audition for the show. How do I get to the casting office or open calls if I am travelling? You must provide your own lodging and transportation to the studio and to the open calls. If you are not able to travel, we highly recommend creating an audition video! Do I have to live in California to apply for the show? 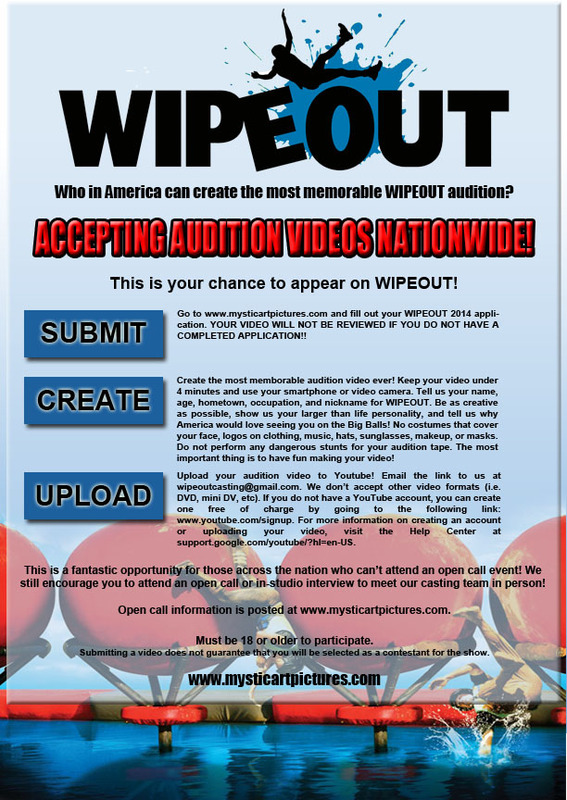 You do not have to live in California to apply for Wipeout. If you are selected to participate on the show, you will be responsible for your own travel expenses and accommodations and may need to make up to 3 trips to California. I am trying to create a profile, but I keep getting a “Profile Fail” message! First, double-check how you are entering your height. If you are 6’0″, please enter your height as 72. The symbols may create a conflict with the system. If you are still having problems, please email our tech support at casting@mysticartpictures.com. Check out some of our FAVORITE moments from our WIPEOUT open calls HERE! [Casting Call] Are you a Furniture Designer? Here’s your chance to design! Pitman Casting wants to hear from them! It’s Your Gyrl, Ms. Carmen aka Platinum Voice PR bringing another Casting Call to you! The Casting for Chicago’s 1st Men’s Fashion Week is almost here. We will be casting over 100 male models for the full weeks events.We are now accepting PRE-CASTING SUBMISSIONS for models. The theme of this years Men’s Fashion Week is HIGH FASHION vs. HARD BODY. The high fashion men versus The hard body boys! 1 week..over 10 fashion events. High Fashion events and runway shows, urban runway shows, underwear/swimwear events, shopping expos, charity work, etc.